The Gentoo Council addressed a few miscellaneous matters this month. The first concerned tinderbox reports to bugs. There was a bit of a back-and-forth in bugzilla with a dispute over whether bugs generated from tinderbox runs that contained logs attached as URLs instead of as files could be closed as INVALID. Normally the use of URLs is discouraged to improve the long-term usability of the bugs. Since efforts were already underway to try to automatically convert linked logs into attached logs it was felt that closing bugs as INVALID was counterproductive. 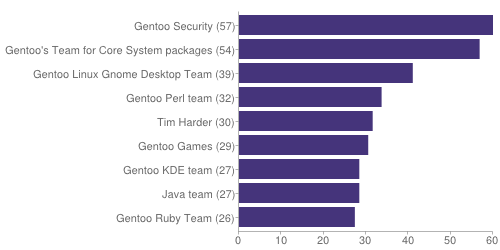 Gentoo is made up of 244 active developers, of which 40 are currently away. 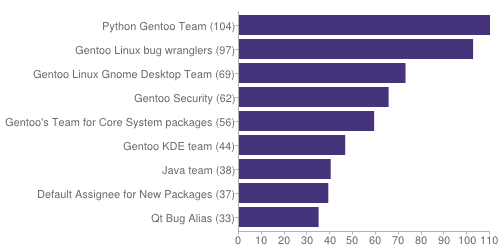 Gentoo has recruited a total of 805 developers since its inception. 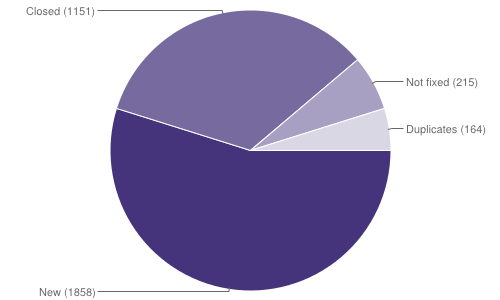 The following tables and charts summarize the activity on Bugzilla between 01 November 2014 and 01 December 2014. Not fixed means bugs that were resolved as NEEDINFO, WONTFIX, CANTFIX, INVALID or UPSTREAM. –alert [ y | n ] (-A short option) Add a terminal bell character (‘\a’) to all interactive prompts. This is especially useful if dependency resolution is taking a long time, and you want emerge to alert you when it is finished. If you use emerge -auAD world, emerge will courteously point out when it has finished calculating the graph. –alert may be ‘y’ or ‘n’. ‘true’ and ‘false’ mean the same thing. Using –alert without an option is the same as using it with ‘y’. Try it with ’emerge -aA portage’. If your terminal emulator is set up to make ‘\a’ into a window manager urgency hint, move your cursor to a different window to get the effect.